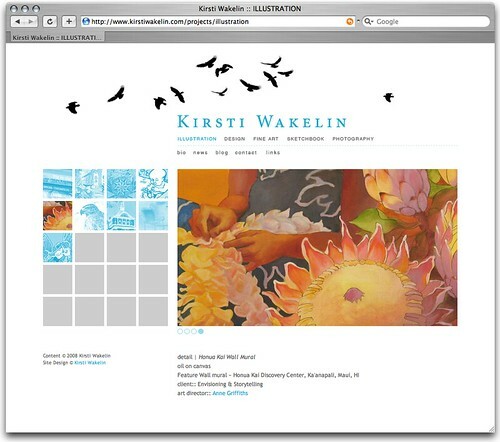 The newly re-designed version of kirstiwakelin.com went live today. Thanks to the tireless work of Arash Ramin of jinnius Solutions Inc. for the web development side I now have a brand spanking new site that works like a dream and is fun to update with its handy new admin panel. Along with this site update, this blog has also had a bit of a face lift (courtesy of Arash) to tie it in with my main site. My website redesign has taken me about 5 years. My hard drive is littered with discarded design ideas. Starting with a complicated, illustration heavy versions, the mockups slowly shed useless elements until I arrived at the current pared-down state. The design was also influenced by the needs of resolvedesign.ca. Because the two sites share the same code base and functionality they needed to be as similar as possible and we spent quite a bit of time discussing how we wanted our work to be viewed. This helped me narrow down a structure for the site – I find it’s always the most difficult to design (or illustrate) something when it’s a completely open road, with no rules, no guidelines and no parameters. 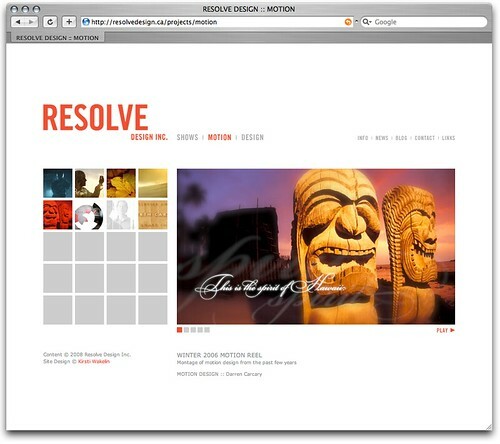 Darren (Resolve Design) and I fortunately share the same design aesthetic. The sites exist to display the work as cleanly as possible without design elements getting in the way. The navigation is intended to be as straightforward as possible, while still allowing us to show as much work as we can. It’s really fun populating a brand new empty site with work. It’s akin to moving into a brand new empty house. There are so many wonderful possibilities. But then I start to unpack the moving boxes and find… old, worn belongings from the old house. Many don’t reflect my current taste in decor. And somewhere along the way there’s a box or two missing… Updating a website is a sure-fire way to reflect on one’s career. And that can be, and has been, exhausting. But it’s still pretty inspiring. There are so many new project spaces to fill up… so many possibilities. The final challenge with the new site lies not with navigation, functionality or portfolio fodder but with the biography. Oh how I hate writing biographies. I hate it just as much as that inevitable question that pops up when meeting someone for the first time… “so, what do you do”? Because what that question really is is “so, what are you?”. And there’s no simple way of answering that. It needs to be a quick bite. One sentence that sums up a lifetime of work experience, expertise and interests. I always feel a bio is a bit fluid. What I write in January might not really reflect how I see my work in August. I inevitably feel like I’m lying through omission; I’m not telling the whole story. But how can I in 200 words or less? I tell stories in pictures. Shouldn’t I be telling my own that way too? But the biography page is the necessary evil that I’ll have to deal with. Expect it to change frequently. I’d like to say it’ll evolve over time… but I think all I can promise is change.